I hope everyone had a wonderful New Year's Eve, and I wish you all a blissful 2012! For my NYE, I spent it at my cousins' house with a feast of food & treats, chat, laughs, and my boyfriend even stopped by to ring in the New Year with us. Task #6: Find the bag of pretzels in your trunk. Get inspired and create something that will amaze me. Post a photo to your blog and write an entry explaining your design. Ask your readers to share ways in which they were inspired to make fashion out of unexpected items here and mention the name of your blog. Having limited resources, I simply used a black Sharpie and colored in the pretzel sticks after scraping some of the protruding salt. I used black thread and tied the three pieces together. Then, I simply just put the necklace chain through the two outside pieces. With the sticks, it reminded me of spikes. I've been seeing this spiked cuff around lately, and well I thought, why not make my own? Like the pretzels from the necklace, I scraped off most of the salt and colored it black. Along with some white speckled branches I pasted it onto this tortoise cuff. P.S. I have yet another exclusive clip from Jane by Design, which will premiere Jan 3! Share with me & Jane by Design in what ways where YOU inspired to make fashion out of unexpected items are here & remember to mention Audrey Allure! Help me get to the end, and I'll be able to choose one of YOU as ABC Family's Trendsetter of the Week! You're so creative, the necklace is something I would so rock! Happy New Year doll! wow, this is really cool! your blog looks fun! This is crazy creative and both designs look amazing! I love the bracelet. I would so wear that. Great looking pieces, very artistic and elegant! Interesting look. I hope you enjoy your shopping Audrey. Oh my gosh, you are so creative!! I wouldn't know what to do with pretzels, beyond eat them that is. P.S. Thanks for commenting on my blog. It means a lot! Wow, this post is such a fun idea. At first I saw the bags of pretzels and was wondering what you were gonna do. This is so much fun and I really like the black. I'd definitely wear that necklace and the bracelet. It's so creative. Girl you once again impressed me!!! I am loving the necklace and the cuff!!! Love what you did with the pretzels! Really impressive! Congratulations! I especially loved the necklace! Thanks fr ur sweet comment.. I love how inspiration comes from the most unusual of places! Gorgeous! and wishing you a very happy new year!!! Hey wow, so creative!!!! So unique! The necklace is something I'd wear any time. Good going sweet fashionista gal! Lovely New Year - I am sooooooooooo glad to have you in my life! Wishing you a great 2012! you are so creative! when do they pick the winner? oh my gosh = HOW CUTE!! 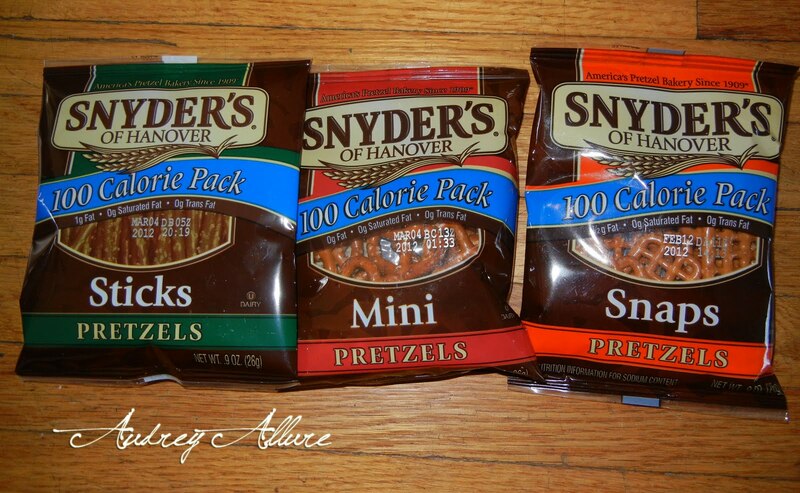 and i am a big big fan of pretzels!! happy new year 2012 audrey, so glad that we've met!! You are so darn creative! That pretzel necklace is adorbs! lovely necklace!My best wishes for this new year! Love that necklace! I would rck it! now that's creative! first i was like, what an awesome pretzel necklace--but then i saw the cuff--even better! have fun on your shopping spree. Beautiful & creative pictures! Happy new year! Oh I totally love that necklace. Good job! This is amazingly creative....that necklace is awesome! Hi Audrey, have fun on the shopping spree. You continue to amaze me with your creativity. Who would've thought pretzels would look so stylish as a neck pendant! Wow, that necklace is cool- what a creative use of pretzels! Happy enw year hope you have a great one! !